In the autumn of the same year (1212) Francis’s burning desire for the conversion of the Saracens led him to embark for Syria, but having been shipwrecked on the coast of Slavonia, he had to return to Ancona. The following spring he devoted himself to evangelizing Central Italy. About this time (1213) Francis received from Count Orlando of Chiusi the mountain of La Verna, an isolated peak among the Tuscan Apennines, rising some 4000 feet above the valley of the Casentino, as a retreat, “especially favorable for contemplation”, to which he might retire from time to time for prayer and rest. For Francis never altogether separated the contemplative from the active life, as the several hermitages associated with his memory, and the quaint regulations he wrote for those living in them bear witness. At one time, indeed, a strong desire to give himself wholly to a life of contemplation seems to have possessed the saint. During the next year (1214) Francis set out for Morocco, in another attempt to reach the infidels and, if needs be, to shed his blood for the Gospel, but while yet in Spain was overtaken by so severe an illness that he was compelled to turn back to Italy once more. Authentic details are unfortunately lacking of Francis’s journey to Spain and sojourn there. It probably took place in the winter of 1214-1215. After his return to Umbria he received several noble and learned men into his order, including his future biographer Thomas of Celano. The next eighteen months comprise, perhaps, the most obscure period of the saint’s life. That he took part in the Lateran Council of 1215 may well be, but it is not certain; we know from Eccleston, however, that Francis was present at the death of Innocent III, which took place at Perugia, in July 1216. 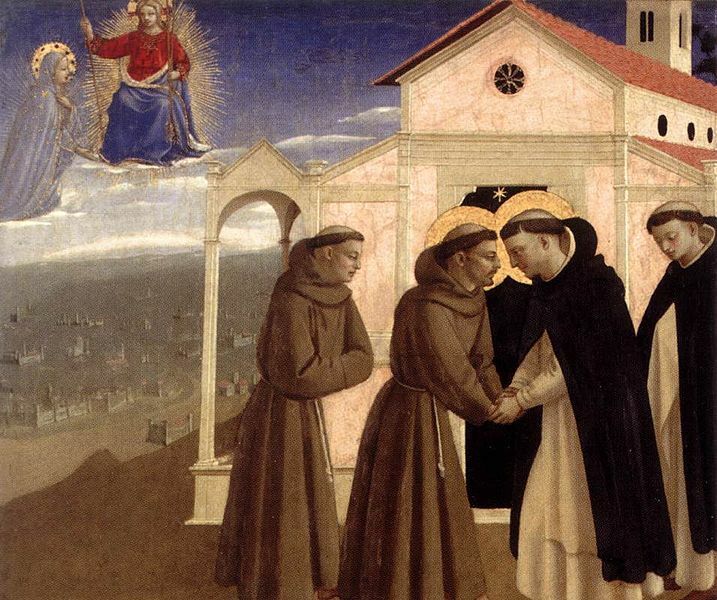 The first general chapter of the Friars Minor was held in May, 1217, at Porziuncola, the order being divided into provinces, and an apportionment made of the Christian world into so many Franciscan missions. Tuscany, Lombardy, Provence, Spain, and Germany were assigned to five of Francis’s principal followers; for himself the saint reserved France, and he actually set out for that kingdom, but on arriving at Florence, was dissuaded from going further by Cardinal Ugolino, who had been made protector of the order in 1216. He therefore sent in his stead Brother Pacificus, who in the world had been renowned as a poet, together with Brother Agnellus, who later on established the Friars Minor in England. Although success came indeed to Francis and his friars, with it came also opposition, and it was with a view to allaying any prejudices the Curia might have imbibed against their methods that Francis, at the instance of Cardinal Ugolino, went to Rome and preached before the pope and cardinals in the Lateran. This visit to the Eternal City, which took place 1217-18, was apparently the occasion of Francis’s memorable meeting with St. Dominic. The year 1218 Francis devoted to missionary tours in Italy, which were a continual triumph for him. He usually preached out of doors, in the market-places, from church steps, from the walls of castle court-yards. Allured by the magic spell of his presence, admiring crowds, unused for the rest to anything like popular preaching in the vernacular, followed Francis from place to place hanging on his lips; church bells rang at his approach; processions of clergy and people advanced to meet him with music and singing; they brought the sick to him to bless and heal, and kissed the very ground on which he trod, and even sought to cut away pieces of his tunic. The extraordinary enthusiasm with which the saint was everywhere welcomed was equaled only by the immediate and visible result of his preaching. His exhortations of the people, for sermons they can hardly be called, short, homely, affectionate, and pathetic, touched even the hardest and most frivolous, and Francis became in sooth a very conqueror of souls. Thus it happened, on one occasion, while the saint was preaching at Camara, a small village near Assisi, that the whole congregation were so moved by his “words of spirit and life” that they presented themselves to him in a body and begged to be admitted into his order. It was to accede, so far as might be, to like requests that Francis devised his Third Order, as it is now called, of the Brothers and Sisters of Penance, which he intended as a sort of middle state between the world and the cloister for those who could not leave their home or desert their wonted avocations in order to enter either the First Order of Friars Minor or the Second Order of Poor Ladies. That Francis prescribed particular duties for these tertiaries is beyond question. They were not to carry arms, or take oaths, or engage in lawsuits, etc. It is also said that he drew up a formal rule for them, but it is clear that the rule, confirmed by Nicholas IV in 1289, does not, at least in the form in which it has come down to us, represent the original rule of the Brothers and Sisters of Penance. In any event, it is customary to assign 1221 as the year of the foundation of this third order, but the date is not certain. At the second general chapter (May, 1219) Francis, bent on realizing his project of evangelizing the infidels, assigned a separate mission to each of his foremost disciples, himself selecting the seat of war between the crusaders and the Saracens. With eleven companions, including Brother Illuminato and Peter of Cattaneo, Francis set sail from Ancona on 21 June, for Saint-Jean d’Acre, and he was present at the siege and taking of Damietta. After preaching there to the assembled Christian forces, Francis fearlessly passed over to the infidel camp, where he was taken prisoner and led before the sultan. 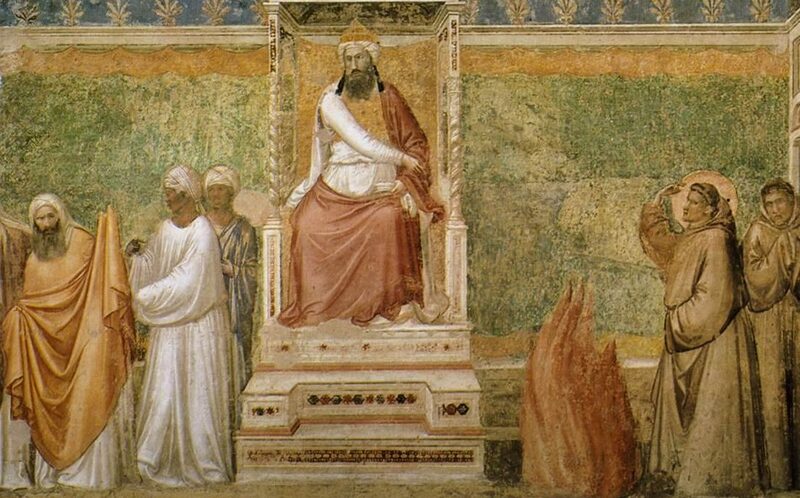 St. Francis attempts to prove the veracity of the Faith with a “Trial of Fire”: whoever passes through the fire unscathed adores the true God. While St. Francis was ready for the challenge, his Islamic counterparts (left) were less than willing to try. According to the testimony of Jacques de Vitry, who was with the crusaders at Damietta, the sultan received Francis with courtesy, but beyond obtaining a promise from this ruler of more indulgent treatment for the Christian captives, the saint’s preaching seems to have effected little. Before returning to Europe, the saint is believed to have visited Palestine and there obtained for the friars the foothold they still retain as guardians of the holy places. What is certain is that Francis was compelled to hasten back to Italy because of various troubles that had arisen there during his absence. News had reached him in the East that Matthew of Narni and Gregory of Naples, the two vicars-general whom he had left in charge of the order, had summoned a chapter which, among other innovations, sought to impose new fasts upon the friars, more severe than the rule required. Moreover, Cardinal Ugolino had conferred on the Poor Ladies a written rule which was practically that of the Benedictine nuns, and Brother Philip, whom Francis had charged with their interests, had accepted it. To make matters worse, John of Capella, one of the saint’s first companions, had assembled a large number of lepers, both men and women, with a view to forming them into a new religious order, and had set out for Rome to seek approval for the rule he had drawn up for these unfortunates. Finally a rumor had been spread abroad that Francis was dead, so that when the saint returned to Italy with brother Elias — he appeared to have arrived at Venice in July, 1220 — a general feeling of unrest prevailed among the friars. Apart from these difficulties, the order was then passing through a period of transition. This entry was posted in Medieval Chivalry, Medieval Saints, Medieval Virtues, Middle Ages and tagged Firars Minor, Islam, St. Dominic, St. Francis, Sultan, trial by fire by RTO.org. Bookmark the permalink.